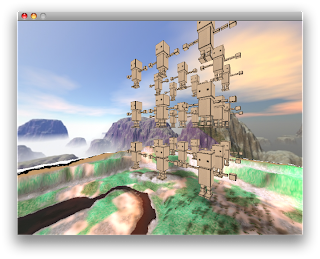 The world of a game development student: SDL ain't dead yet! So far I have most of these things set up, I just need some game objects and start using the core of Bullet. However, I did hit a few snags along the way. 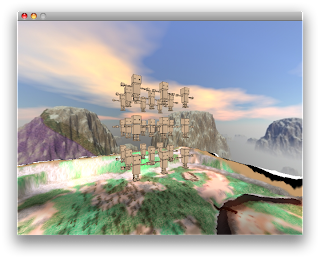 Some are just shortcomings of my current implementations, others a bit odder. Like most of my current projects, I'm attempting to keep my code cross platform by continually building in XCode and Visual Studio and using subversion hosted at Assembla.com. Earlier this week I hit a large snag while using XCode. I had cleaned my project to get rid of several mislinked libraries and unused resources when I discovered that I was getting an EXC_BAD_ACCESS runtime error in some code that had been working just fine for a while. It was in my obj loading phase where I was attempting to push some UV data on a std::vector (like I said, this is a clunky engine). But for some reason this was failing. Oddly enough, I was using other vectors alongside this one in similar ways and they seemed to work just fine. At first, I figured I just needed to claim some memory before using the vector just to be safe. Of course, reserving and even adding some padding data before-hand just caused the application to crash on those operations. After fondling the debugger a bit I found that the type pointer was either null, missing (what) or otherwise ill-defined. This caused some serious head to wall banging as I couldn't understand how the code even existed without knowing what type it was. I convinced myself that there was a problem with initialization of my data member, so I tried putting a constructor into the initializer list (note, I'm doing all this inside my containing class' constructor and not using a pointer to a vector so this shouldn't be a problem), but to no avail. Finally, I decided to stick this thing in Visual Studio and see what happens. Once I got the solution set up and linking to the libraries right, I compiled and.. it ran. No problems, aside from a few small differences in rendering output due to different graphics cards. So either VS was just being nice to me, or XCode wasn't compiling my code right. I gave the problem some time, and when coming back to it I started trying silly things like changing my order of declarations in the class header. Putting the vector declarations first did nothing, putting some declarations in the middle did nothing, but changing the order of the vectors themselves did something. Turns out, whichever vector was declared last would throw this runtime error. What this means I have no clue, I'm not even sure how to Google for that to find a solution. So I ended up "solving" the problem by adding one more vector member aptly named "fuckme". 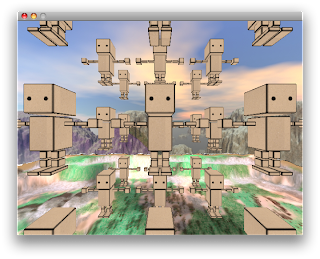 Oh, here are some screenshots of the current build showing off a cube of boxmen, a skybox and working terrain. If you look closely, you might notice that the terrain texture doesn't completely match up to the terrain itself. Don't worry, this is just a proof of concept and that image wasn't intended for this use.